Stroke. 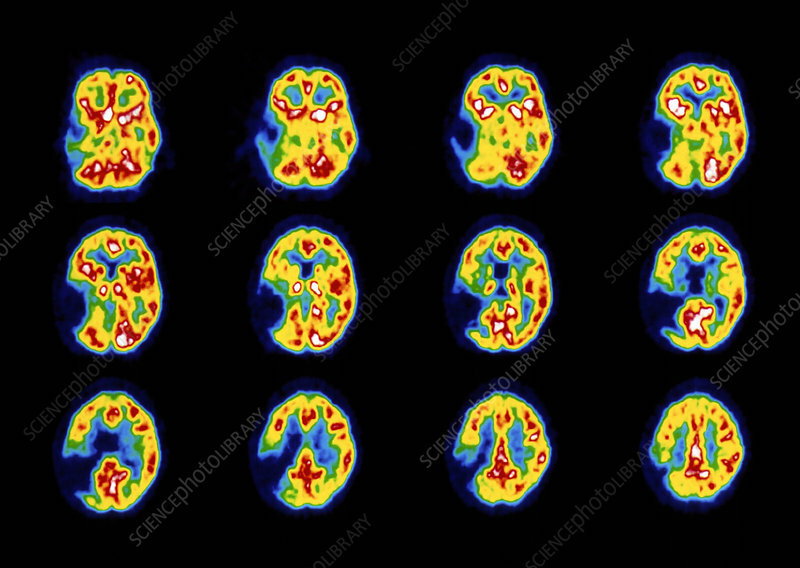 Coloured Positron Emission Tomography (PET) scans of the brain of a stroke patient. Twelve horizontal slices are shown, from deep brain (top left) to superficial (lower right). A lesion is seen in the left hemisphere (dark blue), an area of brain damage with reduced blood flow due to stroke. Colour-coding is: high brain activity (white); low activity (blue). Stroke, or cerebrovascular accident (CVA), is a rupture or blockage of a blood vessel causing brain damage such as loss of speech or paralysis. PET scanning uses an injected radioactive tracer (H2.O15) to show variation in metabolic activity in the brain.